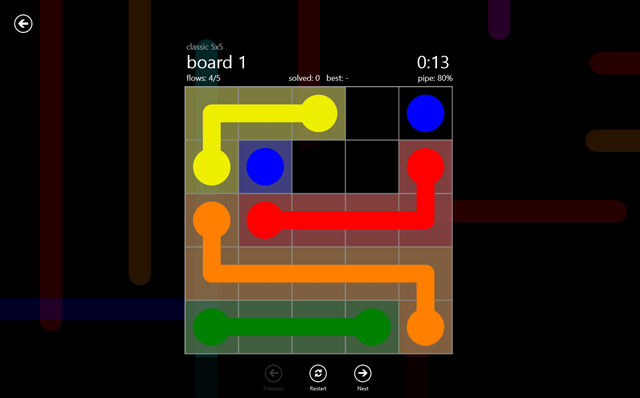 Flow is a Free Windows 8 game app, selected from the ‘Games’ section of Windows 8 Store. This free game for Windows 8 is a good pass time and a really easy game to play. You just have to connect the dots for the game. Well, that’s the actual fact of the game. You have to connect the dots on the game board to just make the water flow inside the connected pipes. This is all you have to do. But, you have to do in very precise moves. Because, you will only have given number of moves in which you have to connect the pipes for the water to flow. There are a number of game modes which you can set according to your convenience. You can actually set your own difficulty level by selecting the game mode. This is the Classic mode of this game app for Windows 8 which is the default mode and quite easy to play. You will get less number of pipes to connect and is easier to solve. For some real challenge, you need to try the other modes. There is also a Time Trial which will be more fun to play. 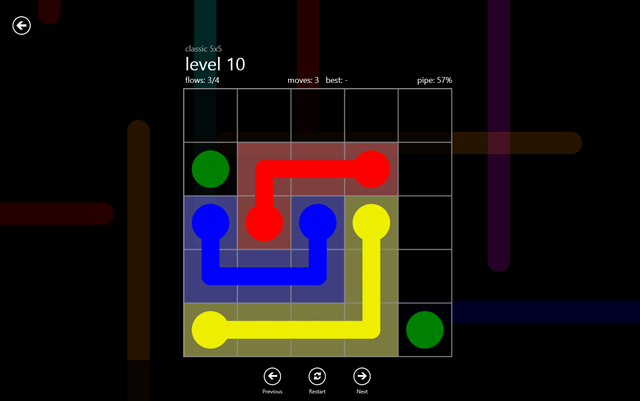 Do not miss out our post on Windows 8 Puzzle Game app. 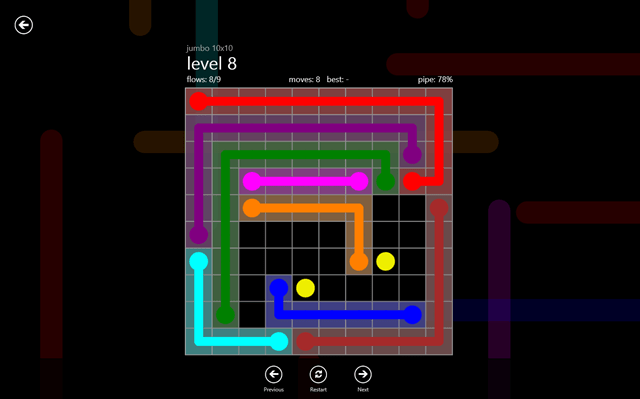 Here at this Windows 8 app, you can see the Jumbo Level where there are a lot more number of pipes to connect along with the Classic Mode which gives your brain a jack hammer. You have to fill the whole board with adjoining pipes to finish the game. This is the Time Trial Mode I was telling you earlier in which you have to beat the time by finishing as many levels you can, in a given time period. So, this Windows 8 game app is quite easy to play and a real great fun. Just search for it in Windows 8 app store, and have some fun joining pipes.